Pharmaceutical & Biotech | PBM Valve - Prominent Worldwide Manufacturer of Safe, Reliable, High Quality Valves! 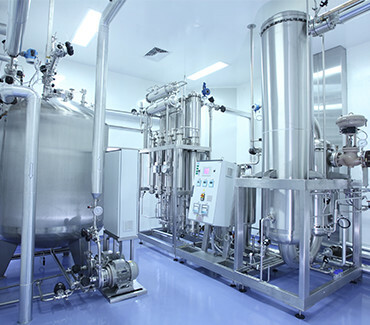 PBM Igenix® valves for the Pharmaceutical and Biotech Industry are specifically designed and tested to perform in many types of sanitary and clean steam applications. PBM’s Igenix® line of valves include low ferrite cast or forged True-Bore® 2 and 3-way ball valves, fire-rated sanitary 2-way valves, spring-less poppet check valves, Rising stem sampling valves, flush bottom tank valves, and 3, 4 and 5-way Multi-port valves, available in 316L stainless, Hastelloy™, AL6XN, and many other alloys. PBM’s Igenix sanitary valves minimize contamination, comply with sanitary regulations (BPE-2014 compliant, USP Class VI elastomers), solve clogging problems, are piggable, available with self-flushing capability, and have bi-directional adjustable seating (Adjust-o-seal®) that allows the valve body cavity to be isolated for cleaning with purge ports as well as adjusting for normal seat wear without having to remove the valve from process line. PBM offers valves in “True-Bore® port diameters for US gauge, DIN, and ISO port diameters. PBM’s engineering and manufacturing teams will work with you to design specific valve configurations to meet your process requirements. Download PBM's Pharmaceutical Solutions Flyer here.